Lady Elena. Photo by Jinx. Pennsic is shortly upon us, and I am in search of gentles to help attend Their Majesties Timothy and Gabrielle. They will need retainers beginning Thursday of Peace Week and continuing through closing ceremonies on Friday of War Week. Each shift is an hour long and every willing gentle is welcome – whether you’d like to retain for one hour on one day, or return multiple times over the course of the war. As always, new retainers are very welcome! If you wish to sign up in advance (really encouraged! ), please get in touch with me. I can be reached via Facebook message (Elena de la Palma) or via email. (elenadelapalma@gmail.com) You can also sign up by coming to Æthelmearc Royal (at the corner of Brewer’s and St. Lawrence, right next to Pennsic University) at any point during Pennsic – even after the War starts, more hands will always be needed! And finally, we will need many hands for some of the bigger events like Opening Ceremonies, Æthelmearc Court, the Known World Party, and Closing Ceremonies. Your help will always be welcome – simply come to Æ Royal before the event and let us know you’d like to help! Generous Æthelmearc, you have been so gracious in attending Their Majesties these past months. 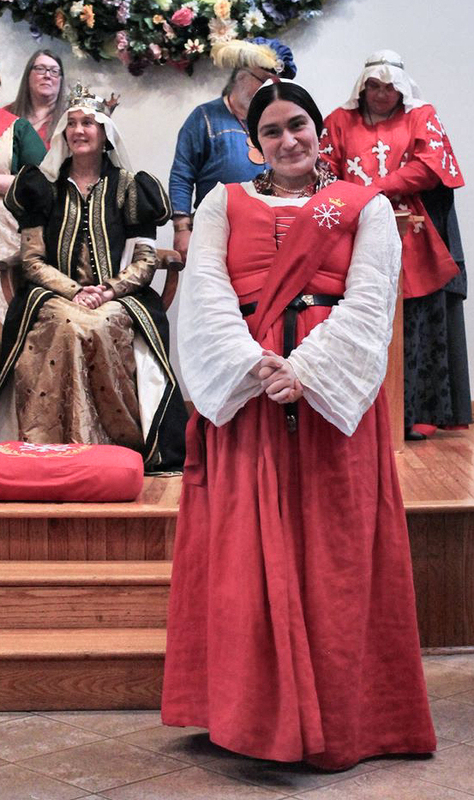 I am humbled with gratitude as I think ahead to Pennsic, and to the many gentles who will give of their time to ensure Their Majesties’ comfort. Truly, there is no place like home! Want to get in touch about retaining for Their Majesties at Pennsic?